This post is going to be a little different than most posts here. I’ve decided I want to be a bit more open about the business side of Useful Fruit. So, I want to talk a little bit about the effect that the Mac App Store has had one month in. Some of the more well-known indy Mac shops have posted some outstanding numbers regarding what they’re seeing in the Mac App Store. I thought it would be helpful to share the experience from a smaller shop. I’ll get right to it. 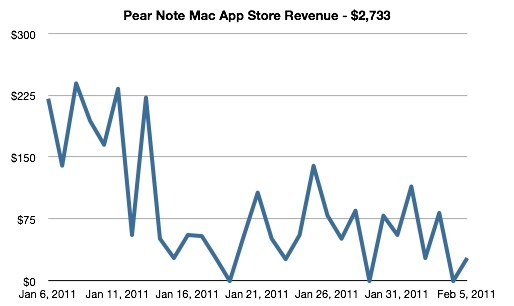 The Mac App Store has more than doubled total revenue from Pear Note, and I’m ecstatic. Sure, others are seeing orders of magnitude improvements, but doubling sales is plenty for me. Note that this happened without playing any pricing games or doing any other unusual stunts. Pear Note on the store is $39.99, the exact same price as it is and always has been when purchased directly. The App Store did not affect direct sales. Sales from my store neither went up or down. They stayed steady. From my perspective, the Mac App Store is another sales channel reaching mostly different customers than my site. That may change over time, but that’s what I’ve seen so far. There was an obvious spike the first week, followed by a sharp drop. Since that drop, sales have been pretty steady. The Mac App Store follows the same purchase patterns of Pear Note that I’ve always had – slow sales on weekends. 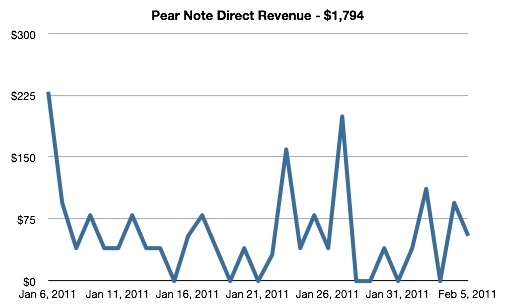 Pear Note has always sold much better during the week than on weekends. This makes sense, since it is primarily used in academic and professional settings. Sales in the Mac App Store follow the same pattern so far. The size of the Mac App Store market is still quite small. This is evident in the dramatic shifts in rankings due to relatively few sales. As you can see below, $100 in sales is enough to shift 50 spots in the Productivity rankings in the U.S. Other countries are much more pronounced, where a single sale can change your ranking dramatically. I’m sure the top few spots require much more revenue to swing very far. 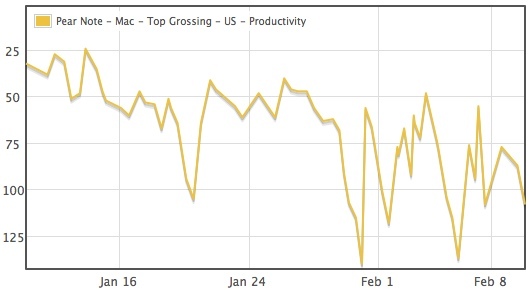 Pear Note has only gotten as high as 24 in the U.S. top grossing Productivity rankings, 102 in the U.S. Overall top grossing rankings, so I can’t speak for the top spots. The Mac App Store has been a great source of revenue for the first month. It’s not a get rich quick scheme, and the million dollars in a month stories are the exception, not the rule. For most of us, the store just represents a new distribution channel with more exposure than any channel we’ve seen before. I expect this to continue and improve over time as more people start using the store and the market grows.